Every now and then I have an urge to de-clutter and organize. Today it manifested with turning (long) scraps into custom bindings. It's by Simplicity. Right now it's 10% off at Joann Fabrics. It adds a special touch to handmades. Isn't this dress just SO cute? That's extra wide bias around the bust part I think....now I have to get the bigger tips for my machine. This is on Modcloth, my absolute FAVE clothing style site. LOVE this stuff! 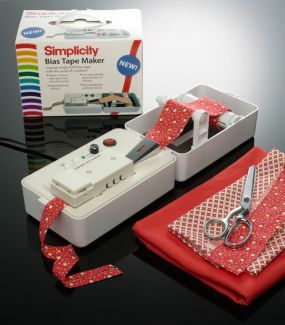 I need one of those litle bias tape makers, too!